One thing we enjoy doing during the winter months is checking out all the local antique stores. We don’t have time to browse during the digging season. By local, I mean a few hours radius drive from our home in Cameron, Missouri . Folks, you can have a lot of family fun with this. Antique store discoveries have been found out there, and who knows, you may find the next big score! I recommend making a day of it because it really can turn into an Epic Treasure Hunt . So jump in your buggy, drive a couple of hours, case the areas antique stores goods, haggle a sweet deal with the proprietor, then get a motel for the night. Who doesn’t enjoy a night away from the same four walls? Not to mention the competition for who was the best haggler. Personally, I think it is me as I walk out of there all Jesse James like. Last Christmas we had a giant snow storm push through that dumped about two feet of the “white stuff”. I was tired of the “go to work, come home” scenario and even more tired of being cooped up in the house when I got off work. Once the roads were cleared off and folks could get around, we went shopping. I needed a new wood project so I had an agenda. There is a local antique store in my area and just by happenstance I made one of those once in a lifetime discoveries. I found a WWI Footlocker, it is featured in this post, but that ain’t all! It included the padlock and matching key. BOOYA!!! Here’s how it all went down. I was walking around gawking at stuff when I came across a couple of old trunks. These trunks were rough and the size of a large dog box . The owner came up and asked, “can I help ya find something, Kelly?” He knew me, I had been there many times since I moved to the area. I have also metal detected his property on several occasions. I asked if he had anything smaller around. He said “no, not really. Well, out back under the lean-to, you might be able to get to them.” I replied with “well, lean the way”. We both laughed and then he said “I’m Sixty some years old, I ain’t going out there.” I told him I would check it out and let him know and headed back to find what he was talking about. When I got out there it didn’t take me long to realize it was still winter, but I was on a mission. That is when one box caught my eye. The lid was half busted off and full of broken kids toys. There were old books half eaten on by mice, but it was something I could work with. The wood was good and with some restoration, it would be good as new. The owner met me at the door and said he would take ten bucks for it but to leave it outside. He also said he had the padlock that came on it which was a huge bonus. The lock cost me three and half times what the box did, but I didn’t really care because it was a matching set. When I was younger I remembered hearing stories of how footlockers became many things back in the day. Well it turns out, my local antique stores hidden treasure was no exception. I stripped off three layers of paint with the wood underneath, which was hard as a rock and Oak at that. Once I removed all the old paint, there was a name and a number. I could make out Uni__d S__t_s, but most of it was unreadable. I also remember old timers telling me that it takes Oak about 100 years to harden to the point that you can’t stain it very good. The lock is a Six Lever with a patent date of June 6th, 1914. The Key still unlocks it as well. I don’t know for fact if it is WWI but I do know I had to replace a bunch of square nails that were in it. You be the judge. So this winter folks, get out there and find that gem in the junk. 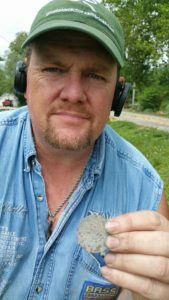 Kelly Noeller Epic Adventures – Treasure hunting and metal detecting.